I have to tell you, I was having trouble with the Stamp of the Month this month. I didn't know what to do with the chairs, but I know chairs are "hot" right now. 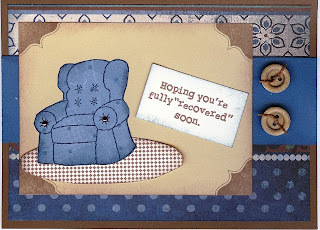 If you haven't seen my other cards with the Stamp of the Month, click here. There you can click onto the Stamp of the Month Blog Hop, where over 50 consultants participate in a big circle and each show what they've done with that month's Stamp of the Month. If you get a chance to go around on the blog hop, you'll see that lots of people did some really cute things with the chairs. 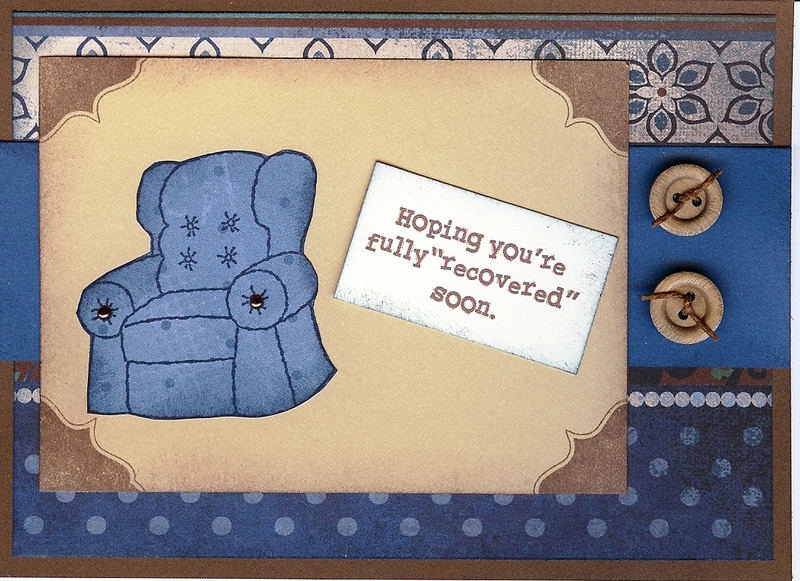 I especially liked the sentiment "Hoping you're fully recovered soon." 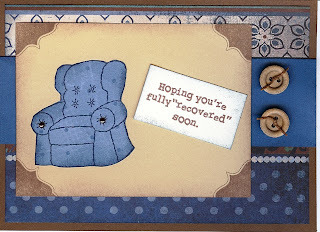 I thought that was perfect with the upholstered chair. I "borrowed" the sentiment. For the chair paper, I knew I wanted to use a small pattern. I'd seen some chairs with larger, bolder patterns on them, and I didn't like them as well. 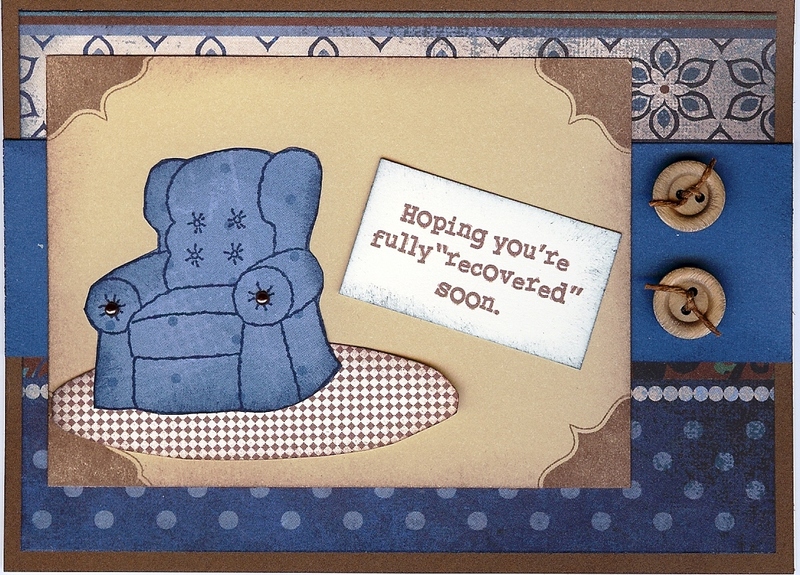 I used the back of the green paper with little polkadots and argyle pattern from Lucky. For the brown faux photo holders on the corners, I used a portion of one of the stamps in the set, Unity. I made the area rug in Word (for Windows), using the Drawing Toolbar. Click on the pull down menu under View. Click on Toolbars. When you put your cursor inside the box, it will turn into a cross. Click once to start your oval and drag your cursor (without taking your finger off the mouse key) to get the size/shape of oval that you want. Right click inside your oval. Click on Format AutoShape. A menu box will appear. On the Colors and Lines tab, play with the colors until you get what you like. On that same tab (Colors and Lines) where you just picked your color, there's a little box at the bottom that says "Fill Effects." That's how I got the little checked pattern in my rug. There are 4 different tabs: Gradient, Texture, Pattern and Picture. I chose Pattern. Choose your pattern. I cut out the oval and sponged around the edge. I also sponged around the edge of the chair, to give it a little depth. I also used the new Wooden Buttons and Mocha Opaques.